A Transition for Cody ... wishing him the best! A Transition for Cody … wishing him the best! This Tuesday, the CFSF team will sadly be saying goodbye to Cody. Cody has accepted a new position With Gil Haugen Construction, and we couldn’t be more excited for him. We have had just shy of 4 years of great coaching, friendship, and just plain fun with Cody. 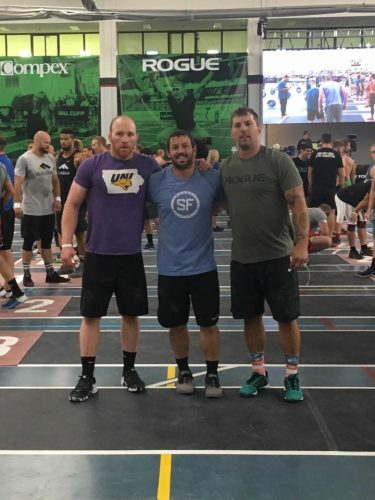 Although it is always hard to say goodbye to a coach, fortunately it is not goodbye forever as we expect many great times ahead inside CFSF with Cody as an active member in the gym. And, after he settles into his new position, we will push for Cody to be in our part-time coaching rotation should he so decide. Cody came to CFSF over 3 years ago by sending us an email out of the blue from Florida, after his time serving in the military in Atlanta, Georgia. We really had no idea who he was and he had no idea about the CFSF community he was about to encounter. We had never hired from outside of the gym, but after much thought we decided it was time to take a chance. I turned out to be one of the best decisions Greg and I have ever made. We have watched Cody grow as a person and on Friday, as many of you know, he will also be getting married to Amy. This week truly is an amazing time of transition with a bright future and many new developments ahead for both he and Amy. We are so excited for them both! As this time of employment comes to an end at CFSF, make sure you take an opportunity to get into the gym and wish Cody well. Tuesday we will be having cake all day in the gym along with a photo card that you will be able to write a message to Cody as a keepsake. Come let him know how much you appreciate the last 3 plus years. And encourage him to remain in the mix as a member and coach as he transitions in this fantastic new life together with Amy and a new career. Cody, this truly is an amazing week in your life and we could not be more excited. All the Best Cody! Coach and friend!!! You made crossfit fun for me when I scared shitless to try it two years ago! I am so happy and excited for your future!!!!! !